Brian and Nick Davis with Twin Pomegranates Wine. Madera County Farm Bureau members since 2008. What year did your Company/Business/Farm get started? 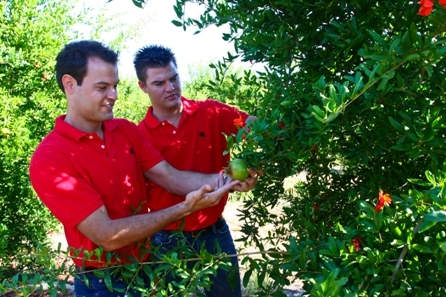 We began Twin Pomegranates in early 2008, but our family has been farming in Madera County for several generations. We are the 4th generation of Agribusiness. What kinds of products/merchandise do you sell/grow/distribute? All of our wines are pomegranate based. We produce wine made from, pretty much, all pomegranates. We have a straight pomegranate table wine we refer to as a cocktail wine, a straight pomegranate sparkling wine, and a blend of white wine and pomegranate wine. We will have the newest addition to our wines, a sweet wine we call “Sweetie”, in a bottle near the beginning of September. We have our wines in stores from primarily Central to Northern California, and a little distribution in the San Diego area. You can see a retail store near you by going to http://twinpomegranates.com/pomegranatewinelocations.html. Who is the target audience for your Company? Are you part of a family owned business? Which family members help run the business? Our business was founded within our family’s farming operation. After graduating from college, we thought we’d produce something of greater value from something we already grow. Most of our education and experience is in wine and thought that was the route my brother and I would take. We considered the high competition within the wine industry and found a niche we thought we could fill with our pomegranate fruit wine. Our grandfather grows our fruit; we produce the wine and market it with advice and support from our family. What kind of discounts do you offer your customers? Any special monthly or yearly sales events? Follow our Facebook page and other social medias to find out when we run promotions for discounts and swag. .What kind of community projects does your company participate in? We hardly ever turn down any organization hosting a wine event or pouring to help raise funds for good causes. In addition to helping many charities and non-profits locally and around California, we have taken it a step further. As we are small and aren’t able to make a very big impact, we have put together a program to help bring many wineries together to make a stronger impact on our local community. To get more information, go to MyGlassCounts.com or to www.facebook.com/MyGlassCounts and see how the public can help grow this program. We also have an event planned for Oct 9th, with the Valley Animal Center, Fresno, called Paws & Pomegranates. This year, Paws & Poms will be held at ApCal and we will be looking to find homes for a few of their furry friends as well as to raise a little cash to help fuel the service the VAC provides. Where would you like to position your company in the next 5 to 10 years? I believe the Central Valley is one of the best places in California to grow great quality wine grapes and we’d like to be able to provide more wines produced from our family’s vineyards to wine drinkers all over California. Our pomegranate wines are rare amongst the many grape wines and we hope to expose wine enthusiasts all over California to the unique and distinct flavors of pomegranates. What changes have you made in your business to stay up to date with current trends? For example: new products, today’s youth, the green movement, alternative sources of power, advertising strategy, etc. We are a new modern wine company and we have modern views of how people share information and experiences. We live in a time when information is passed from one person to another at different speeds. We found that people are and will always be talking about your business or products, and that we need to join the conversation to be available to answers questions or problems and promote awareness for ourselves. We found the best way to do this it to use many of the social marketing tools in the online world. As farmer’s, we cared about a lot smaller group of buyers and marketed our crops very differently than when we are trying to reach a much larger pool of buyers. We stay connected to people and business trough a lot of social mediums, including Facebook, Twitter, YouTube, LinkedIn, Flicker, and reaching out to bloggers. People have the ability to research topics of any subject super fast and we make sure we are easily found by interested people.We also have a new wine soon to be released. We call it our Sweetie since it will be more like a desert wine. We had an awesome time working with our fans to produce a bottle aesthetically appealing and deliciously satisfying. Most people we talk to about our wines automatically think “sweet” when we say “pomegranate”. Most people say they’d rather drink a dry or table wine, but actually many people do prefer a wine with a little sweetness so we listened to our fans and now “Sweetie” will be the newest all pomegranate wine to our portfolio. Which California Farm Bureau benefit do you find most beneficial to your company? I think it’s important to have good representation. I know the Farm Bureau has my needs in mind when it’s influencing decision makers higher on the totem pole than I. Agriculture is such a huge job provider and income generator for our state and I am confident the Farm Bureau understands the needs of its members and is trying to make business and our way of life less stressful and more sustainable and secure. We also put a high level of importance on education and like to see assistance given to young scholars to further their carriers in Agriculture. My brother I are former recipients of college scholarships from the Madera Farm Bureau. We appreciated the help and know we are just a few benefactors of the hard work the Farm Bureau does to support agricultural education. D & D AG Services LLC.